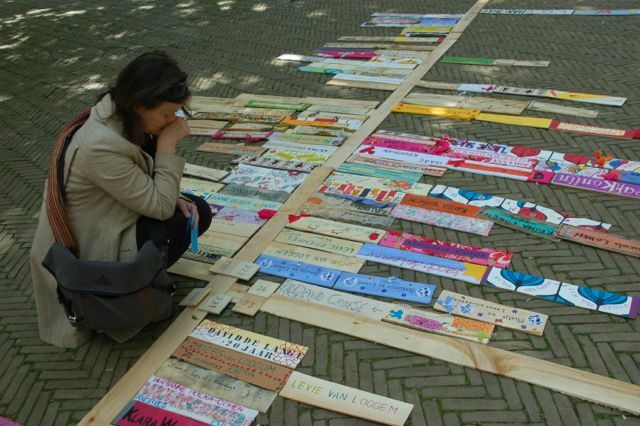 On May 4th we commemorate with the project Names and Numbers the 2800 Jews who were deported from Oosterparkbuurt. 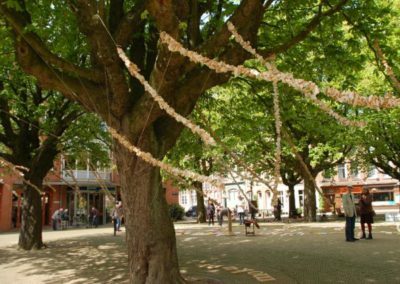 Kastanjeplein is commemoration site which is specially decorated so that everyone can symbolically bring a Jewish victim back home step for step, because we think that they belong to us and to our painful history! Participants start at the Time Office where they consciously make the decision to step into ritual time. 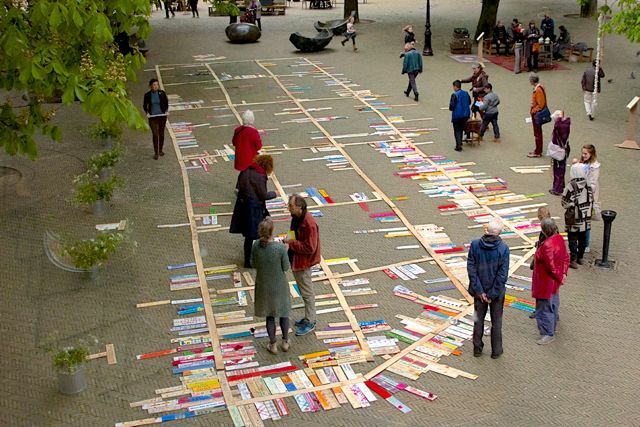 They then choose a name from the Name Archive and make a personal nameboard which they lay at the correct address and location on a large map of the neighborhood. 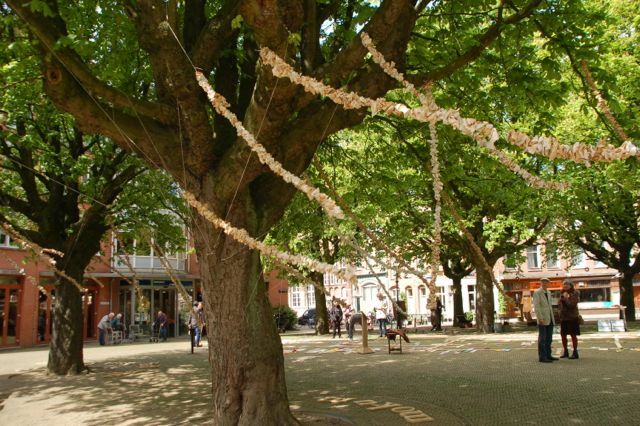 This ‘Street monument’ has been growing every year. 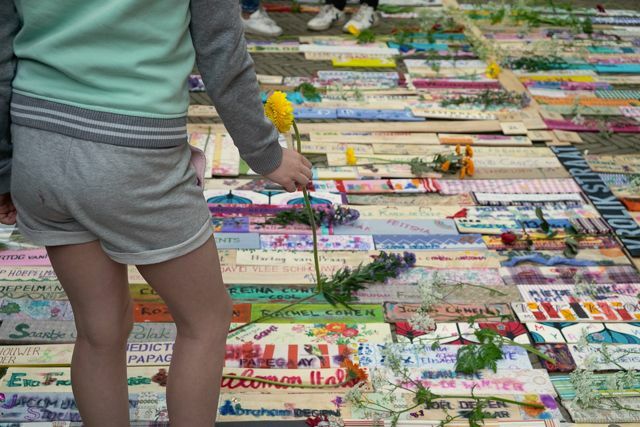 It is a temporary monument to an infinite loss, which becomes the center of the memorial ceremony in the evening. 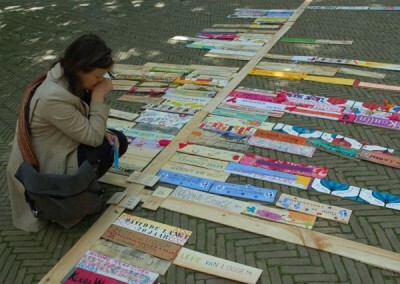 In 2020 we hope to symbolically bring all 2800 victims of that piece of the Oosterpark neighborhood home. 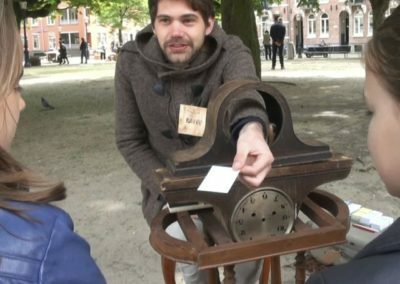 Video Namen en Nummers, by Joep Bajema, highschool student Pieter Nieuwland College. 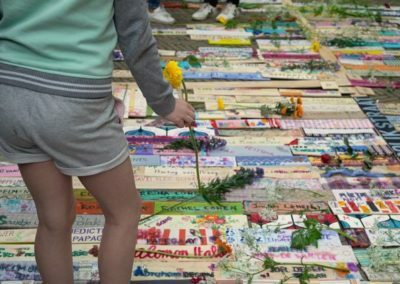 ‘Rituals can help provide a place for the pain of loss and death. 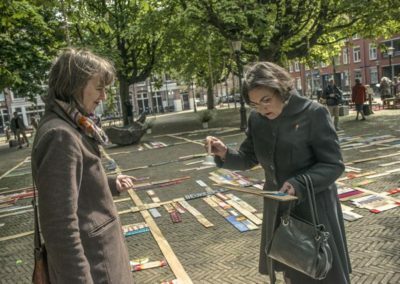 This project aims to bring the number of victims of the Holocaust to the core of what it is: the sum of unique people with their own stories. This attempt to ‘re-humanize’ numbers is needed in our time of “numbers of refugees”. An exciting project, carried out professionally, but deeply embedded in the environment where it should be carried out. 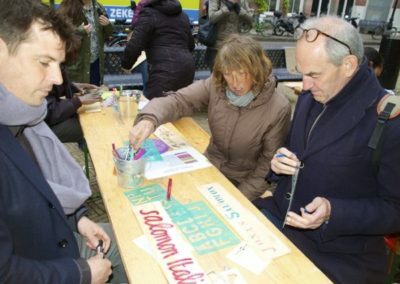 Job Cohen, chairman of the Amsterdam 4th and 5th May Committee: ‘Wonderful how they pick up the history of the neighborhood in a very special way and how they really involve the neighborhood. A highlight of my 4th & 5th of May 2017 ‘. 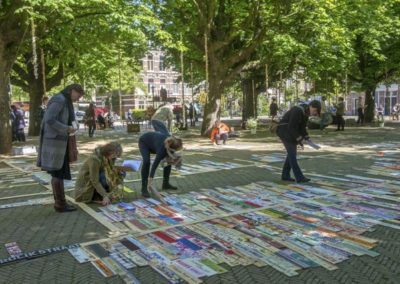 Thanks to: 2012 – 2018. Financing Amsterdams Fonds voor de Kunst, The Art of Impact (Mondriaan Foundation), VSBfonds, Fonds voor Oost, crowdfunding Voor je Buurt (80 donateurs), municipality of Amsterdam (4th and 5th of May Committee, Citizenschip and Diversity), crowd funding For the Neighborhood. Sponsors: Stadshout, Albert Heijn, flowershop Middenweg, Manor hotel, Hartog bakery, Royal Institute of the Tropics. Concept and artistic director Ida van der Lee. 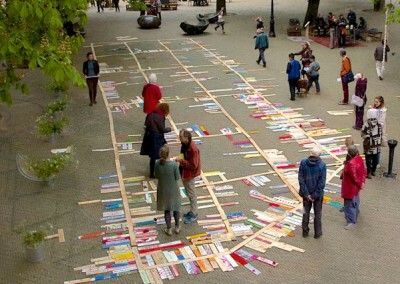 Neighborhood committee: Amos Frank, Bert Runhaar, Ieke Ginjaar, Emmi Schumacher, Gerrie Buijze, Anna Hekker. Song performance (2014-2016) directed by Nicoline Snaas met the choral groups: Angels (director: Tatiana Lina), Din Jin (director: Marjan Linnenbank), Op Reis (director: Jetta Starreveld), Vocal Group Bant (director: Ronald Becker), Tell Mama (director: Nicoline Snaas), Women’s Company (director: Marjan Politiek), Hebrew Groove (director: Noam Vazana), Gaia and Friends and Ellacapella (director: Astrid Louwers), Dance: Mati Elias, violin Anti von Klewitz and Sander Hoving, string bass Sven Schuster. Linnaeuskoor. Choir performance (2018) directed by Emma Rekers. Artists (between 2012 – 2019) Thérèse van de Berg, Liesje van den Berk, Carla Budding, Klaartje Dullemond, Esther Eij, Saar Frieling, Simone de Groot, Isa ten Haeff, Carla Hoekenga, Cathelijn van Goor, Pavel van Houten, Arletta Kaper, Wendela Kloosterman, Itie Langeland, Saskia Laurant, Mechtild Prins, Joanne Swaan, Petra Veenstra. Moving Arts Projects met Diane Elshout, Janine Toussaint, Noud Verhave, Mattie van de Worm. Catering: Mahwash Aziz Volunteers (between 2012 – 2019) : Channa All, Erin van Alten, Tim van Alten, Mahwash Aziz, Joep Bajema, Annemiek Bakker, Esther van Bavel, Anne Berk, Eleonoor van Beusekom, Lies Bierenbroodspot, Pierre de Boer, Roelie Boon, Saskia Boot, Francis Borst, Grady van den Bosch, Arja Broere, Jose Dekker, Claudia van Dijk, Froukje Dijkshoorn, Wout van Dishoeck, Caecilia van der Drift, Nini van Driel, Peet van Duijnhoven, Peter Düker, Marieke van Eijkelen, Hans Elsinga, Judith Ensel, Farhad Fahali, Aurea Fernandes, Meike Genee, Mirjam Gerritsen, Timo Gilhuis, Ieke Ginjaar, Marja aan ‘t Goor, Anne Goossens, Jeltje Gordon-Lennox, Hella de Groot, Jack en Alice de Groot, Jo Haen, Mijke de Hartog, Liz Hathway, Chelly Hartog, Marjolijn Heijnen, Aad Hekker, Anna Hekker, Emily Ijzerman, Catherine Jonkhoff, Marian Iping, Ellen Kaptijn, Marella Karpe, Noor Karpe, Peter Kersbergen, Eyad Khamis, Oksanne Khrebtova, Marijke Kienstra, Anja Koning, Margreet Kooistra, Magdalena Koopmans, Wendela Kloosterman, Heather Kurzbauer, Yael Kurzbauer, Anne Marieke Kussendrager, Suze de Lang, Tonny van der Lee, Bernadette van der Louw, Hanneke van der Louw, Mirjam Makkenze, Anita Manshanden, Simone Manuputty, Daphne Meijer, Judith Ment, Dido Mirck, Joemie Moes, Mohammed, Amy Molin, Ellen Mulder, Gerdi Nauta, Ko Oelslager, Carolien van Oenen, Elly Overman, Denise Payne, Mieke Richter, Ellen Ros, Edmund de Ru, Bert Runhaar, Rita Rutten, Noa van Scherpenzeel, Emmi Schumacher, Isabelle Schuurmans, Sivan Schuurmans, Harmen Snel, Marike Soeterik, Hedwig Speulman, Sylvia Steenis, Liesbeth Stoute, Jose Taekema, Monique Thoonsen, Hatice Tumer, Reiny van Twillert, Martin Verbeet, Bertine Verloop, Jan Visser, Biem Vlaming, Mayke Vullings, Bert Vuurberg, Henriette van der Waal, Freddie Walker, Corine Weerman, Bill Wei, Liesbeth Weinans, Reezy Wilson, Kirsten de Wit. Others: Kees Lamper (website), Max Linsen and Marja Sonneveld (photography), Mayra Paula (intern), Marlene Rooseman (p.r. and text), Lucas van Royen (film), Arnold Weel (graphic design), Ko Schuurman (production), Robin Verkeek (technical). 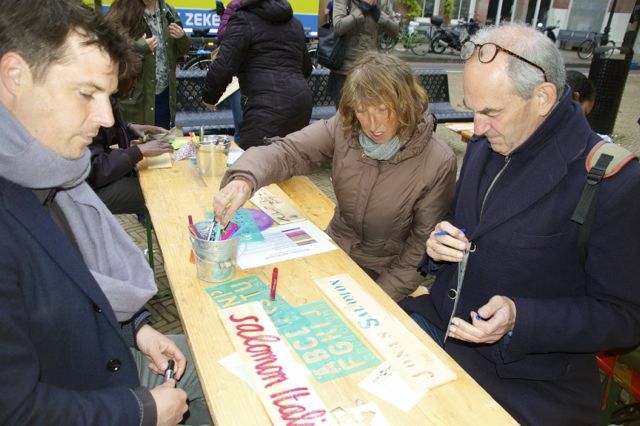 In cooperation with: ABG Parochie, Amsterdam 4 and 5 May Committee, Cultuur Ondernemen, Geheugen van Oost, city district Amsterdam Stadsdeel Oost, Grafisch Werkcentrum Amsterdam, Hogeschool van Amsterdam / BOOT, Joods Historisch Museum, Live Oost Festival – de Rode Loper, National Committee 4 and 5 May, War in My Neighborhood, De Rode Loper op School, Allerzielen Alom Foundation, Assadaaka society, Stadshout foundation, nursing home Kastanjehof, Grade Schools: Barbaraschool, De Kaap, De Kleine Kapitein. St Lidwinaschool, Linnaeusschool, St. Nicolaas Lyceum, Iganatius Gymnasium, Pieter Nieuwland College.